The Tethered Aerostat Radar System (TARS) is an American low-level airborne ground surveillance system that uses aerostats (moored balloons) as radar platforms. Similar systems include the EL/M-2083 and JLENS. The aerostats are large fabric envelopes filled with helium, and can rise up to an altitude of 15,000 feet (4,600 m) while tethered by a single cable. The largest lifts a 1000 kg payload to an operating altitude providing low-level, downward-looking radar coverage. The aerostat consists of four major parts or assemblies: the hull and fin, windscreen and radar platform, airborne power generator, and rigging, and tether; they are kite balloons obtaining aerodynamic lift from relative wind as well as buoyancy from being lighter than air. The hull of the aerostat contains two parts separated by a gas-tight fabric partition. The upper chamber is filled with helium and provides the aerostat's lifting capability. The lower chamber of the hull is a pressurized air compartment. The hull is constructed of a lightweight polyurethane-coated Tedlar fabric. An airborne engine drives the generator, supplied by a 100-gallon diesel fuel tank. Beginning in the late 1990s, the aerostat sites were equipped with Lockheed Martin 420K aerostats. 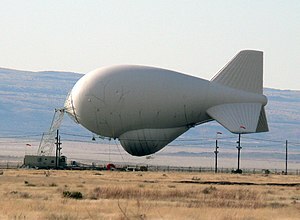 This blimp carries the Lockheed Martin L-88 as its primary payload, a surveillance radar with a range of 370 km (200 nm). The 420K's envelope shape, fin design, and cable attachment points are further optimized for high aerodynamic stability and easy ground handling. While Lockheed Martin is the prime contractor for the 420K aerostats, the envelopes are built by ILC Dover. As of 2004, all TARS sites except one were equipped with the 420K aerostats. The exception is Cudjoe Key, which uses two smaller, but otherwise similar, Lockheed Martin 275K blimps. One carries the L-88(V)3, a light-weight L-88 derivative, while the other is used to transmit the Radio y Televisión Martí TV program into Cuba. The first aerostats were assigned to the United States Air Force in December 1980 at Cudjoe Key, Fla. During the 1980s, the U.S. Customs Service operated a network of aerostats to help counter illegal drug trafficking. Their first site was built at High Rock, Grand Bahamas Island, in 1984. The second site was built at Fort Huachuca, Ariz., in 1986. Before 1992, three agencies operated the TARS network: the Air Force, U.S. Customs Service and U.S. Coast Guard. Congress in 1992 transferred management of the system to the Defense Department, with the Air Force as executive agent. Under Air Force management, through contract consolidation and system standardization, the operations and maintenance cost per site was reduced from $6 million in fiscal year 1992 to $3.5 million in 2007. However the Budget Control Act of 2011 slashed funding for the Air Force, which tried to shut down the project. However, the U.S. Customs and Border Protection (CBP) assumed responsibility the Tethered Aerostat Radar System (TARS) project and its funding since fiscal year 2014. Operators launch the aerostat from a large circular launch pad containing a mooring fixed or mobile system. The mooring systems contain a large winch with 25,000 feet (7,600 m) of tether cable. Operational availability is generally limited only by the weather (60 percent standard) and routine maintenance downtime. The aerostats are stable in winds below 65 knots (120 km/h). Aerostat and equipment availability averages more than 98 percent system-wide. For security and safety reasons, air space around Air Force aerostat sites is restricted for a radius of at least two to three statute miles and an altitude up to 15,000 feet (4,600 m). The primary mission is to provide low-level radar surveillance along the southwest border of the United States and Mexico, the Straits of Florida and the Caribbean in support of federal agencies involved in the nation's drug interdiction program. The secondary mission is to provide North American Aerospace Defense Command with low-level surveillance coverage for air sovereignty in the Florida Straits. The aerostat radar data is available to NORAD and U.S. Customs and Border Protection. Operational Sites: Yuma and Fort Huachuca, Ariz.; Deming, N.M.; Marfa, Eagle Pass,Rio Grande City,and South Padre Island, Texas; Cudjoe Key, Fla.; and Lajas, Puerto Rico. Sites located at Morgan City, La., and Matagorda, Texas, are in a cold-storage configuration. Contract management office and logistics hub are located in Newport News, Va. and El Paso, Tx. respectively. ^ "Tethered Aerostats". Designation-systems.net. 2005-09-13. Retrieved 2013-06-15. ^ "Budget could deflate USAF border blimps." ^ Office of National Drug Control Policy, Fiscal Year 2014 Budget and Performance Summary, pages 49 and 118. This page was last edited on 8 November 2018, at 04:43 (UTC).